Greetings. Jim is in Florida right now -- I assume he's in Tampa by now -- as are the Blues, who stayed over in Fort Lauderdale last night before flying to Tampa this morning. They were scheduled to be on the ice right now, but with how busy their schedule is, it wouldn't surprise me if they had an optional skate today. (Which is my way of saying I haven't heard.) In any case, if you've got questions, let's go. What can we expect from the Blues at the trade deadline? If they continue to win, might they add some complimentary pieces? Would they still trade their UFA's for some draft picks? What say you!? The Blues are in a weird situation, in that if they played like everyone thought they would at the start of the season, they would be a real good team, but they haven't done that enough to make you confident they would do it. But, since Dec. 11, they have the 8th best record in the league, so you have to start to think maybe they can do that. I think they trade the UFAs, though maybe they keep one of Gunnarsson or Bouwmeester so they have six experienced D. (Unless they're totally sold on what one of their players in San Antonio can do.) Who they keep would probably depend on who they would get the most for in a trade. The Blues don't have a first or fourth round pick next season -- I'm assuming that first round pick won't end up being a top 10 anymore that they would keep -- so getting a draft pick or two back would probably be welcomed. I can't see them dealing any prospects for a player, unless it was someone who they were no longer sold on or who seemed expendable. So they might trade someone for a draft pick and then get someone for a draft pick. But I don't see them going in in a big way to acquire people. Before we start ordering our playoff tickets let’s pull in the reins a bit. We lost to the Kings before the break. We beat a slumping Anaheim and Columbus team and squeaked out a win against the Panthers. In the next 12 games the Blues play 10 of those against teams they are looking up at in the standings. The Blues almost have to go 9-3 or 8-4 to distance them from the pack for a playoff spot. A record of .500 or less and they seriously have to consider being sellers at the deadline. Any possibility of the Blues looking at Wayne Simmonds? Sure, there's a possibility, though if the Flyers keep winning, they might be in a situation to hang on to him to make a playoff run of their own. The Flyers are seven points out of a playoff spot, though it's take a pretty impressive run to get that far. They're kind of the Blues East, with a rookie goalie who has been their savior. I realize we are one point out of a playoff spot but anyone that thinks we can make a long run in the playoffs is sadly mistaken. You are never going to get a better return for Petro than you will now. If you can get a first rounder and prospects for Schenn, do it. Get what you can for Steen just to get rid of his horrible contract. If someone offers you a mid-level draft pick for Maroon or Boumeester, grab it and run. Kyrou has no business playing in San Antonio right now. He should be up here with the big club gaining valuable experience. By virtue of being in the Central Division, with Winnipeg and Nashville looming, a long playoff run seems unlikely, though, since Dec. 11, the Blues and Predators have the same number of points, though the Blues have done it in two fewer games. This weekend will be telling. The last time the Blues played Nashville, they beat them 6-2 in Berube's second game. Can the Blues compete with the Predators? We'll see. Yes, the trade return on Pietrangelo or Schenn would never be higher. With Toronto acquiring Muzzin and signing Matthews and negotiating with Marner. the Leafs may be out of the picture, and that always seemed the best fit. Schenn has underperformed, though he has done better since being moved to the wing. I don't think you can trade Steen; his contract and his age pretty much takes care of that. The Blues appear to disagree with you on Kyrou. Is Allen's time with the Blues all but numbered or are they going to kick the can down the road a little bit longer. I see them kicking the can. As well as Binnington is playing, it's way too early for the Blues to go all in on him. Last season, just when Hutton looked ready to take over, he got hurt, Allen went back in and did pretty well until the final few games of the season. It's uncertain what Columbus will do with Bobrovsky, and a team like Florida might drive his price real high. The boys are enjoying 80 degree weather today, I hope they are going slow on the adult beverages while on the beach. The Bolts are not the Panthers, the Lightning lost last night and will be in a surly mood when they meet our guys tomorrow night. I will be at the game, if we can play and keep the game close for 60 minutes I will be happy. However, winning the same is definitely possible Binner is a winner, if he is in net we have a chance. CHIEF...PLAY THE KID! Chief and his staff can have all the beverages they want, adult or otherwise. The only reason I would think Binnington wouldn't play is if they feel they need to get Allen a game since it's been a while for him. (He hasn't played since Jan. 17.) Tampa Bay doesn't lose much, especially at home, where they are 20-5-1. But the Blues won in Winnipeg, with Allen in goal, and they don't lose much at home either, so who knows? But it would be a fourth win in a row for the Blues, something they haven't done yet this season. Prior to or after the Caps game on January 3 Tom Wilson said he would reach out to Sundqvist and discuss the cheap shot/hit. To your knowledge has he? Sundqvist indicated after the game with the Caps that he had not heard at all from Wilson, and if it hadn't happened then, when they were in the same building, I doubt it has happened since. Wilson said if the situation presented itself, he would. As Sundqvist said that day, it's up to him. I think the quote was, "He hit me." Why does steen remain on the 2nd line? There are better options and that line isn’t producing points. Too make a run a really good second line is winning. Before we get into we’ll they are winning why change the lines, that’s not really a great approach as the second line is not the reason we are winning. When Perron's back, you'll see him there, and if Perron is out longer, you could see Thomas there once they're ready to give him more minutes. (I think that's why he's been on the fourth line now, to keep his minutes in check while he gets back up to speed.) In the meantime, there aren't a whole lot of other options, unless you want to put Maroon there. Jim just filed this blog from Tampa. 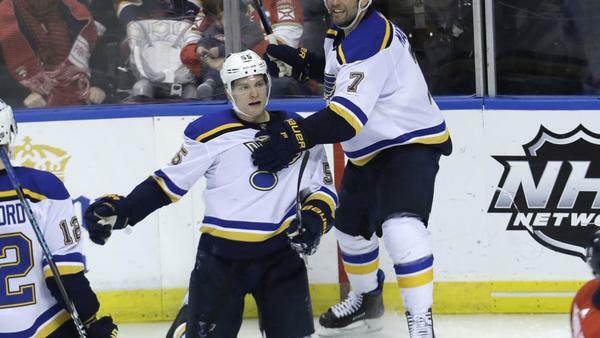 stltoday.comBefore scoring a third period goal Tuesday against Florida, the Blues' defenseman helped prevent a first-period goal by the Panthers. Thanks for hosting TT! I read a Vladi quote the other day, about "..a lot of stuff going on around the team early in the season..." (not his exact words). The timing of it and the way it was phrased really piqued my curiosity, and I took it to mean more than new faces, a fired coach. Am I wrong? Any chance you can speculate in this space what he may have been talking about? Thx again! Tarasenko said that when they resumed practice after the break, and when we followed up on what he meant by stuff going on, he declined to expand, saying that was in the past. (It's one of the challenges of interviewing many athletes, who say things are in the past and don't want to talk to about them because they're in the past, or say things are in the future and they can't think about that yet. There's about a 30-minute window it seems they'll talk about.) As to what he might be referring to, it's hard to say, since we don't know the time frame but the team's play on the ice early in the season says this was a team that didn't come together as smoothly as the team would have liked, and when that happens, it's either because stuff is going on or stuff is going on because of that. As I've said many a time, losing locker rooms are seldom happy locker rooms. Do you see the Blues trying to trade Allen next season? It’s easy to see that they will keep him the rest of this season. I feel like a team would give a draft pick or 2 for Allen and also Husso is almost NHL ready. The play of Binnington, and of Husso, has changed the goalie situation. The expectation was that after a season of regular play for Husso in the AHL, he would be ready to move up and be Allen's backup, or challenge for the starting job, next season. Binnington was on the periphery. Now, Husso has been hurt and hasn't played much, and when he has, his numbers haven't been as good as Binnington's. What happens the rest of the season will determine what happens. If it stays like this, with Binnington playing most of the games and becoming the de facto No. 1 goalie, then it would seem Allen would be on the market. But would the team feel comfortable in having Binnington and Husso as their two goalies on a team that could be a playoff contender? Would you? But there's still plenty of time for the tide to shift, for Binnington to hit a bumpy spot and Allen to step back in and his history says he would do just well enough for the team to think he can continue to be the guy going forward. Binnington still has to prove himself. I don't think 11 games are enough for the Blues to anoint him as The Guy. But I think a deal with Allen is a possibility, though gosh it's hard to figure out goalies. Husso is NOT NHL ready, he has not played in almost 2 weeks down here in San Antonio and is the reason why the Rampage have such a huge hole to dig out of. All signs point to it being a concussion. Whenever there's an iffy statement on when someone might return, that's usually the cause. It looked like he was going to be back right after the break, but that hasn't happened. I believe Binnington has to play 30 games this season or he becomes a rfa. The Blues are winning with him in net. Do you think he gets the 30 games or are the Blues not concerned with that that you know of? Are you going to make me go through the CBA to check this? Per capfriendly, he's an arbitration-eligible RFA after this season. He's played 11 games and the Blues have 31 to go, so if he gets another 19 is all up to him. The Blues have eight sets of back to backs still to go, and if you figure Allen gets at least one of those, that leaves 23 for Binnington is he starts every game that's not part of a back to back. He'll have to play very well to get that kind of a workload. In any case, I doubt if the Blues care. Berube is coaching for his job, too. Fabbri should be in the lineup tomorrow night, the Bolts are fast and we need that dimension. Also, I read Petro was hit in the head last game, maybe he comes out and Bortuzzo comes in? Pietrangelo finished the game. I don't know that he missed a shift after taking that puck to the face. NHL coaches are creatures of habit, loathe to make lineup changes if the team is winning. If Bortuzzo goes in, he goes in for someone else unless there's some lingering trouble for Pietrangelo we don't know about. As for Fabbri, he's ready to go in, but they've been very pleased with MacEachern's play, and he's the most likely guy to come out. The Blues have an interesting situation coming up this off season. They should have a good amount of cap space, they have Thomas and Kyrou that should be ready for bigger roles, they have Klostin and Bokk on the horizon and they could fill depth roles similar to what Thomas and Kyrou are doing now. They also have Allen on the roster, and that seems like a weakness that needs to be corrected. Do you see the Blues making some moves this off season? Does their window of true contention start in 2019-20? Well, I wrote that the window opened this season, so I've been wrong before. People who live with analytics say that the one thing that was holding the Blues back this season was going to be the goaltending, and early in the season, Allen had some bad numbers. His numbers still aren't great, but they've took a definite step up. The Blues average almost a goal per game more with Binnington in goal than with Allen. Is it just random luck or does the team play better -- or more confidently -- in front of Binnington than in front of Allen? One thing we haven't seen much of from Binnington so far has been the soft goal. There's been maybe one he's wanted to have back. With Allen, there have been more, and that's always an issue, because those goals can be devastating to a team's morale and, as even the Blues have admitted, this was a team with a weak psyche early in the season. They seem to be able to handle things better now. Armstrong has talked about the possibility of a "hockey trade," swapping talent for talent, and that could easily happen in the offseason. Kyrou still hasn't proved himself at the NHL level, and Kostin seems ready to get a long look, and if the team feels they're ready, that could lead to a trade up front to open space. One mystery that will linger is how Fabbri will fit in. For what it's worth, I loved the Blues' music choice after the game last night. Laura Brannigan had a great voice and she died far too young. But is "Gloria" really disco? I would say no, but I respect Jim's musical knowledge. According to the wikipedia listing on Gloria, the song was "embraced by dance clubs" and was nominated for a Grammy for best female pop vocal performance. Do you know or have you heard if Mr. Robinson has told Parayko to play more physical and use his 6’ 6” size to be effective? I know when Robinson was a young player in the minors we was told to play tough and use his size or he wouldn’t make it. Also, it’s good to see Parayko shooting more, he should start hitting some opposing player’s ankles trying to block that cannon of his and the league will get out of his way. I think everyone with the Blues, from Armstrong down to the equipment managers, has probably told Parayko about using his size and being more physical. The other thing he hears a lot is that he should shoot more. His 118 shots right now are third on the team, though his pace is actually a little off last season. But his shooting percentage is almost tripled from last season, at 7.6 percent, which would be a career high for him. Tom -- As always, thanks for the chat. I thought the season was toast after that brutal home loss to the Islanders in early January. Binnington's situation isn't quite as dramatic as Kurt Warner coming out nowhere, but it does remind us why we love sports. Did you or Jim get a sense during the pre-season he was in the Blues plans at all? All I remember hearing was that Husso was nearly ready and might be a regular by season's end. I really like how Binnington looks to be very even-keel and also seems to have a mental toughness, maybe due to the fact nothing ever came easy for him. Thoughts, please?? Thanks. I will hang up and listen. With everyone looking up in the standings, I'm worried about Chicago, they've been doing good lately. Would it be a stretch to see the Blues and Blackhawks pass the Wild and Avs for the WC Spots? No, there was no sense he was the guy. They looked at Husso a lot more, and Husso had some good performances in the preseason. Husso got one or two full games if I recall. Binnington didn't. We didn't say Husso was ready, but the feeling was that one full season in the AHL, where he was starting two out of three games, would get him ready and get him fully adjusted to the North American game and the grind after playing in Europe. There's a case to be made that nothing has come easy for Binnington. To put the season he put up last season while essentially being in absentia maybe should not be discounted. It no doubt took some solid mental effort to do that. I'm not quite sold on Chicago being back in it yet. They've got a long way to go, have played more games than anyone else, and their roster is every bit as iffy as it used to be when they were losing all the time. They've gotten hot for a bit and have closed in, but aren't all the way there and if they don't keep it up, they will drop back quickly (which isn't too much different from the Blues, though they have gotten there and have been playing better longer). But they do have to be taken seriously as more than a team that opponents will roll over. Most of the websites that figure postseason chances remain skeptical. The Blackhawks will need to keep this up for a bit longer.